The Symbol of the Church Of God In Christ, shown at the top left and in the background, is an outgrowth of the Presiding Bishop's Coat of Arms which has become quite familiar to the Church. 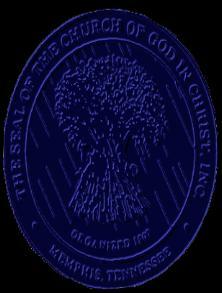 The design of the Official Seal of the Church was created in 1973 and adopted in the General Assembly in 1981 (April Session). This information was reprinted from the book"So you want to KNOW YOUR CHURCH" by Alferd Z. Hall, Jr.